STUMBLING MICE are… Tom Blower: guitar & vocals; Tom “Pepsi” Piepszowski: harmonica & vocals; Joe Sykes: bass & vocals; Myles Rutledge: drums & vocals; Bob Monteleone: guitar & vocals. 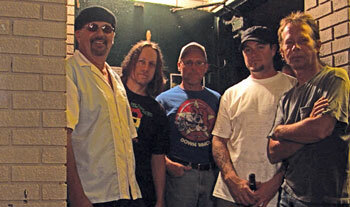 The band’s history goes way back… All the guys (except Bob) played together roughly 10 years ago as T-Bone Pepper. Myles left to play with MY MACHINE and other original bands. Joe and Bob played together 25 years ago in WAYCO. Bob’s known Tom “Pepsi” for about that long as Tom P.
All the guys (except Bob) played together roughly 10 years ago as T-Bone Pepper. Myles left to play with MY MACHINE and other original bands. Joe and Bob played together 25 years ago in WAYCO. Bob’s known Tom “Pepsi” for about that long as Tom P. sang with ROADHOUSE which formed out of the remnants of WAYCO. 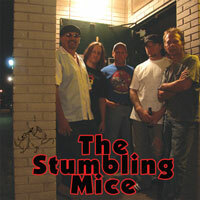 The band was officially christened THE STUMBLING MICE late in 2005 when they held a twice monthly house gig with a different drummer at a defunct Detroit restaurant called Mile’s World. Eventually, Myles Rutledge rejoined and the band started playing regularly at biker bar Erin Pub along with other Detroit “joints”. The late, great Jim Noel filled in on keyboards when Bob couldn’t make it. The Stumbling Mice have been spending the last few years playing showcase rooms (Callahan’s Music Theater) and festivals (Royal Oak’s Arts, Eats & Beats) as well as the occasional benefit, bar gig or special event (North Channel Yacht Club’s Annual Ribs Competition). They have started recording at Bob’s Sterritt Sound studio and hope to have something to offer the world in 2016.